Using a metal tape measure take the width of the visible window frame at the top, middle and the bottom of the frame. 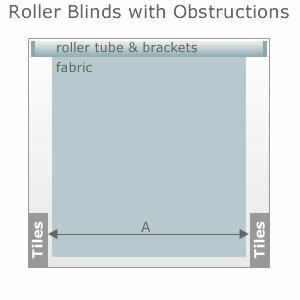 If there are any obstructions within the recess such as a dado rail or part tiling then measure in between the obstructions (except for roller blinds - see roller blinds with obstructions below). Next measure the height (drop) of the visible window frame at both sides and in the middle. To measure for a blind intended to fit outside the window recess we recommend an overlap of 10cm to each edge as shown in the illustration. Measure as for a recess fit (above) and add 20cm to each measurement. If the window sill protrudes far enough to obstruct the blind, only add 10cm to the height (drop) and allow the blind to sit on the sill. 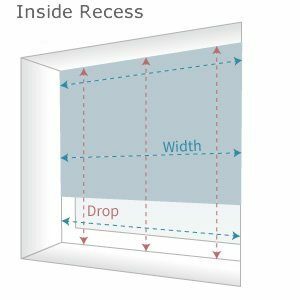 1) Inside Recess - Choose this option if you have measured from wall to wall inside the recess and we will make the necessary adjustments. 2) Outside Recess - See measuring instructions above. 3) Bracket to Bracket - This option will be the complete width of the blind from bracket to bracket. So the fabric will be 34 mm (3.4 cm) narrower than the width you enter. 4) Fabric Size - This option will be that actual width of the fabric. So the overall width of the complete blind (including the brackets) will be 34 mm (3.4 cm) wider than the fabric width you enter. 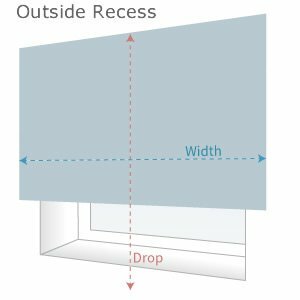 If the obstructions are less than 15 mm (1.5 cm) per side, measure the width at the top of the window and select the 'Inside Recess' option. If the obstructions are greater than 15 mm per side, take measurement 'A' at the narrowest point inside the obstructions with a metal tape measure, then deduct 5 mm (0.5 cm) from this measurement and select the option 'Fabric Size'. How to Measure a Bay Window for 25mm Wooden Venetian Blinds. How to Measure a Bay Window for 35mm Wooden Venetian Blinds. How to Measure a Bay Window for 50mm Wooden Venetian Blinds. How to Measure Bay Windows for Made to Measure Roller Blinds. How to Measure Bay Windows for Made to Measure Vertical Blinds. For the blind to operate freely we make a 10mm deduction off the width. For the drop, the allowance depends on the type of blind. Vertical blinds have a 12mm deduction off the drop. Venetian blinds have an allowance of between 2 to 4 cm on the drop (depending on the slat size) to allow for slat movement. We supply the blind to the size you have specified with no deductions. So make sure of any allowance requirement yourself to ensure the blind operates freely. Note that for roller blinds the fabric will always be 34 mm (3.4 cm) narrower than the overall width of the blind, as the overall width includes the controls and the brackets. Note - There is a manufacturing tolerance of up to 5 mm on all blinds. Measuring up for Made to Measure Curtains. Always measure the total width of the curtain track or pole (excluding the finials) - not the window, unless it is wall to wall. 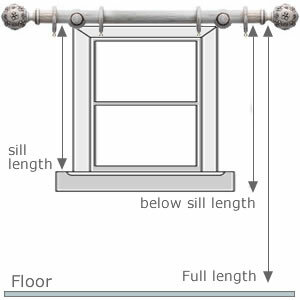 If your fitting a new track or pole, it should extend between 15cm (6 inches) and 30cm (12 inches) either side of the window recess (to allow the curtains to be stacked back away from the window) and between 12cm (5 inches) and 15cm (6 inches) above the window recess. Don’t forget to allow for the fabric overlap – this is an additional measurement, normally 2.5cm (1 inch) that allows the curtains to overlap in the middle of the track or pole when they are closed. Measure from one end to the other. For a curtain tracks that overlap in the middle, include the overlap in the measurements (see diagram). Measure the width of A + B and then add the two sizes together. Measure between the decorative (finial) ends of the pole. For the drop measure in at least 3 positions along the length of the track or pole as floors and sills are very rarely level. To avoid curtains dragging across the floor or sill use the shortest of these measurements. As a rule, measure the drop from the underside of the curtain rings to ensure the pole can be seen above the curtains. This does depend on the type of heading you choose however (see the diagrams below for the different styles of heading and how to measure for them). Before measuring the drop for the curtains, decide whether you want your curtains to fall to the sill, below the sill or to the floor. If you are using a curtain track, measure from the top of the track to where the curtain is to finish (Approx 1cm above the floor). If you are using a curtain pole, measure from the underside of the curtain ring to where the curtain is to finish (Approx. 1cm above the floor). Measure from the top of the pole to where you want the curtains to finish.